The Globalmediapro SC1C takes power from a standard car's cigarette lighter socket and charges Globalmediapro batteries using D-Tap input. The SC1C is light, small and very reliable. It has no moving parts, battery mount, nor fan. 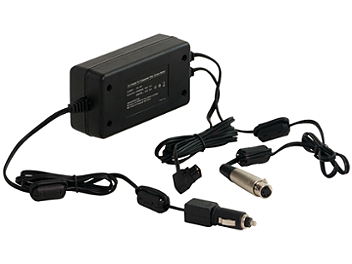 Equipped with regulated DC 12V output (XLR4 connector). Reliable, no moving parts, solid built. Charges Globalmediapro batteries regardless their mount type.